Certification of the upgraded Sukhoi Superjet 100 (SSJ 100) version, which is equipped with saberlet blended winglets, has been postponed to the second quarter of 2019, according to Alexander Rubtsov, president of the Russian aircraft’s manufacturer Sukhoi Civil Aircraft Co (SCAC). The target, initially planned for late 2017, is already a year behind schedule, following a hard landing during a flight trial programme which disabled one of the test aircraft, causing further delay. “The tests [of the winglet-equipped version] were suspended due to the collapsed landing gear after a hard landing. We are now completing the repairs on this aircraft and the second one will join [the programme] shortly. 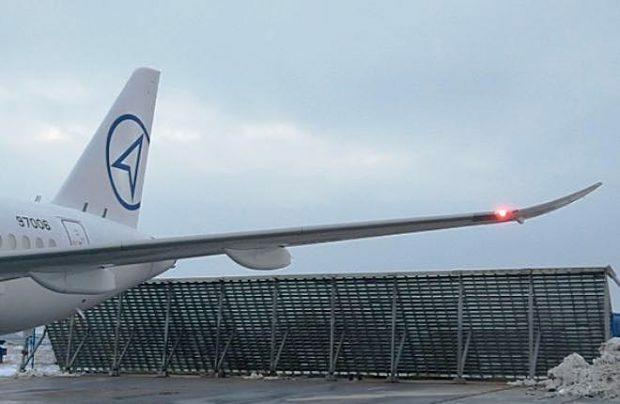 The plan is to have the aircraft certified in the second quarter of 2019, first in Russia, then in Europe,” Rubtsov comments. The aforementioned incident involved aircraft (serial number 97006) in July 2018. Originally, the manufacturer reported that the aircraft had sustained only “unsubstantial damage” and would shortly resume testing after being restored. Russia’s Severstal Airlines remains poised to become the launch operator of the upgraded version. “So far we have the impression that Severstal will become the launch operator of this aircraft. Although they wanted an aircraft with winglets, physically we’ll likely be able to install them no earlier than the second quarter of 2019,” Rubtsov has admitted to Russian Aviation Insider. Severstal signed a letter of intent for the financial leasing of four SSJ 100s and an option for further two, with deliveries scheduled to begin before the end of the year. It is believed the aircraft will be retrofitted with saberlets once they are certified. Aeroflot has also opted for winglets to be installed on the 100 Russian regional jets it ordered on September 10th in a major announcement, in a deal which remains subject to corporate approval and the completion of contractual documentation. Other operators of the SSJ 100, including Mexico’s Interjet and Ireland’s CityJet, are also considering the upgraded version. The winglets significantly improve the aircraft’s runway performance as well as its handling characteristics. The development will be offered both as an option for new aircraft and as a retrofit.